It's not bad at all! The one I just purchased could be the new model as shown. It is not bad at all, not that bad as all previous reviews. Lightweight, easy loading, and double trigger safety have paid off the price. 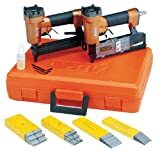 This is a low cost, light duty nailer. The problem is, the plunger seldom returns to full height and the next brad just doesn't go. If you spray the plunger path with lots of WD-40, you might have a chance of getting your project finished. This was my first nailer and I didn't know better until I got my Porter Cable Finish Nailer. With the success that I had with it, I immediately went out and got the Porter Cable 1 1/4" brad nailer and my problems disappeared. Fork out the extra ($$$), you won't be sorry! I am a professional trim carpenter and have 4 of these guns.. I have had good luck with them.. Occasional jam, but nothing serious.. Have been dropped several times, by me and my workers.. Haven't had one break yet, from dropping.. Just need occasional oiling(like almost all guns) and keep nailing.. Spend $20 more and get a tool twice as good. The only Airy nailer I've used self-destructed after a few months of use. This is a tool designed for very light use in a workshop- and don't ever drop it. both are light weight tools and out of every brand i've used (all of them) these fit into tighter areas. This set is alright, but the safety switch is next to the trigger instead of on the nose of the gun. It will go off easily if your not careful. Your hand also gets tired from have to pull the trigger every time. The Airy contractor kit is another best value from Airy tools. Once again they have exceeded my expectations. The 18 Ga nailer in the kit is light weight and does the job. The 18 Ga stapler is also the same in performance. The durabilty on the tools are great and I have had the tools for about 3 months now. I have used it every day on the job site and the tools are performing extremely well. I definitely got my money' s worth. 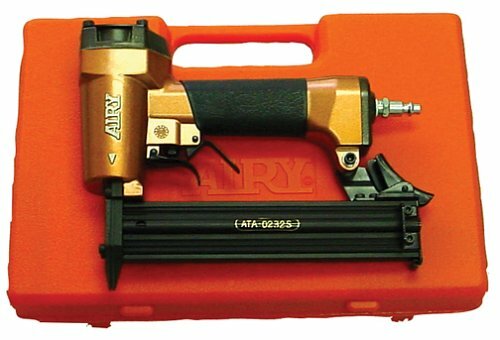 Airy tools is one of the best value in pneumatic tools out in the market today. I purchased the Staplemate about 6 months ago. Just got tired of electric and hand-operated staplers and poor operation in hard wood. Replaced the muslin on the bottom of the box springs today. It was a breeze. This little champ does a great job. I like the fact that I can use 1/4" T-50 staples. If you use this tool just a few times a year you will love it. I did throw away my two hand operated stapler and sold my electric one. 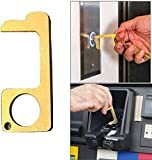 Buy the Airy Staplemate if you are driving staples in hard or soft woodand you want them to work each and every time. I have been through at least two manual or electric staplers a year before finding this one. This is a durable pnuematic driven product designed to handle relatively light duty staples. It is the only compressor driven stapler I have found that can size down to 1/4" T-50 arrow brand staples. A very unique and hard to find tool for those who do a lot of light stapling. What a great little tool !! I have had my little Airy since June 2000. I couldn't be happier. This is a must have item! I doubt you will find a better bargin anywhere. Regardless if your project is large or small, you will love this stapler. The quality exceeded my expectations.